So far, 2019 has been the year of finishing things I meant to do in 2018. And I have to say, I am off to a pretty good start! 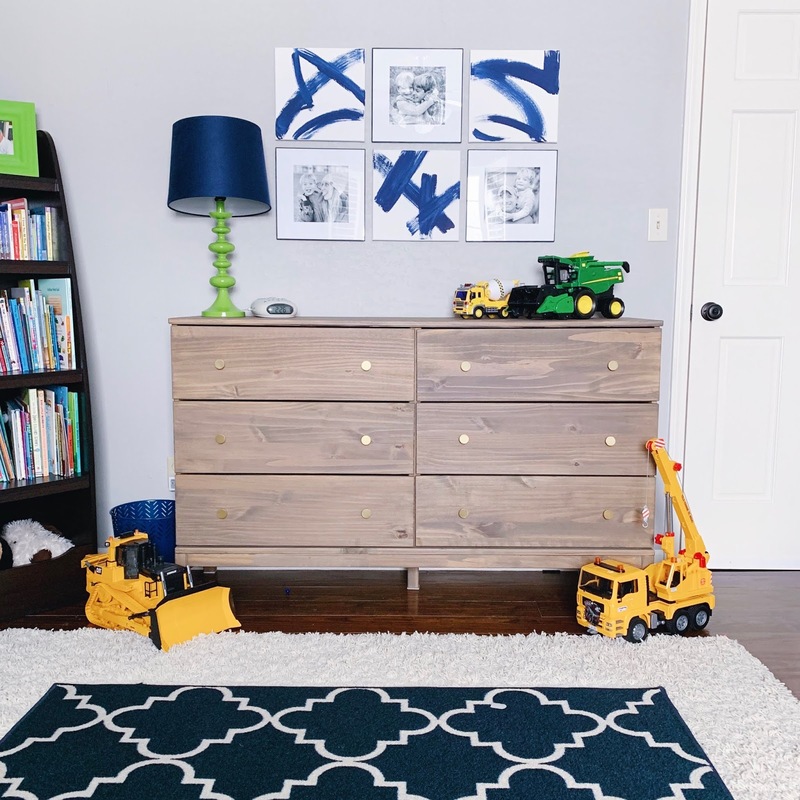 One thing I have been able to check off my list is finally getting this dresser completed for Beckham's room. After making his bed last year (I will get a post published on that soon), I wanted to find an unfinished dresser, which I could stain with the same Old Barn Milk Paint stain to coordinate. Finding an unfinished dresser was more difficult than I thought! Enter good ole IKEA! We are just back from our trip to Paradise Island, Bahamas, and I am in full laundry mode. WHY is there always SO much laundry to do whenever you leave town? It seems like we go through so many more clothes. Anyway, we had a really great time and it was definitely nice to feel that warm sunshine after the harsh winter we have endured! I wanted to share a few things that made traveling a little easier and also a few things I saw other people had that I immediately put in my Amazon shopping cart to have for our next trip. A while back, I asked you guys what you would like to see from me, and one of the requests was for a hair tutorial! So, although I am no expert, I put together a little video to show you what I do when I actually take the time to curl my hair. I have been using this wand for several years now and I love it! It is super inexpensive, but it holds curl better than any other wand or curling iron I have tried in the past. I will link all of the items I mention in the video. Scroll down to shop the post. I love a good, hearty soup! It has been colder than a polar bear's toenails here in the midwest and cold weather always makes me want warm, comforting soups. 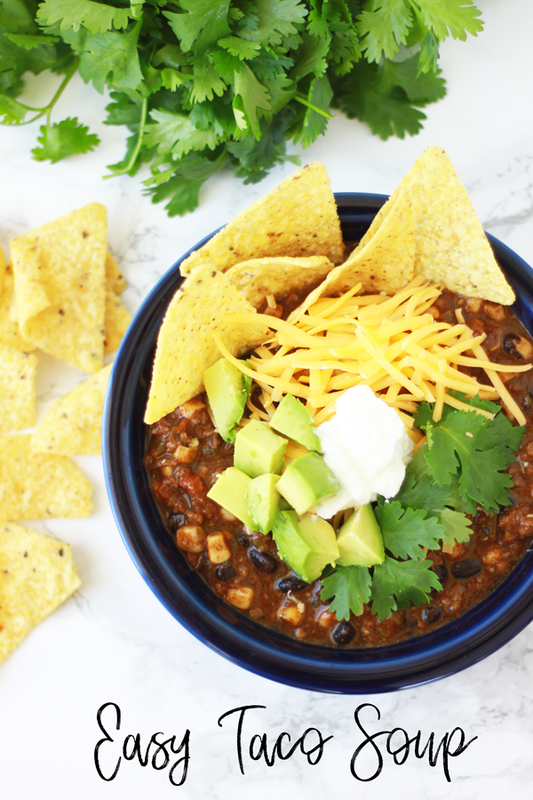 This Taco Soup is a favorite because #1), it's super easy to make, and #2), three out of four people in this house will eat it...and that's a win in my book! It's amazing served with some cheese quesadillas (which is what family member #4 usually eats when we have this soup). I shared this recipe on Instagram previously, but I wanted to post it here also because I know not all of you are on the 'gram! And, it's good to have an actual post to refer back to. I use my Instant Pot to make this simply because I can make the entire thing in one dish and not have to clean any other pots. Can I get a hallelujah? But, you could definitely make it on the stovetop or the crockpot. Seriously though, if you don't own an Instant Pot, HOW ARE YOU SUCCEEDING AT LIFE? I use mine at least once a week, if not more. It is a workhorse, and I love it so! One of my most frequently asked questions is in regards to my overly distressed pair of jeans. Whenever I post a pic of them, I always get asked where they are from. I got them at American Eagle...but 3 years ago. Last year, AE did not have a pair that in my opinion equaled the fabulousness of mine, but this year they came through! And, they are exactly the same as the originals! And, American Eagle is currently having their friends and family sale, so most items are 30% off! I'm sharing these highly coveted jeans and the rest of the goodies I recently tried on below. Warning, there are lots of awesome finds...and one major dud. Ready or Not...Swimsuits Are Here! I am so conflicted because I so badly yearn for that spring and summer sunshine hitting my face and giving me a glow! BUT, I am not looking forward to shedding this sherpa pullover that has become part of my body, only to find out that what I thought was padding from my fluffy shirt is in fact my own personal padding. Winter. It has a way of creeping up on me...and taking residence in my thighs. But, like it or not, swimsuit season is around the corner. And for some of us, that corner is getting closer and closer. We usually lay low for Spring Break, but this year we are joining the best of them and taking the boys to the beach! Despite my lack of enthusiasm for donning a swimsuit, I am SO excited to get the heck out of this midwest weather and get some vitamin D! Naturally, with a beach trip coming up, I have been on the hunt for all things beachy...including swimsuits. Below, I'm sharing a few that I've recently ordered along with some others that caught my eye. Hey friends! It's been a LONG time since my last Lovin' Lately post, so it's well overdue! I have a few things I thought about writing individual blog posts on, but then considering the reality of that actually happening was little to none, I decided to combine them all here! I have been stalking the Ugg McKay boots since last year. I love my Uggs, but I love that these aren't so bulky. However, I didn't want to spend that much on them. Then, I came across these for a fraction of the price! I wanted to try them to see if they were cheaply made, but I have practically lived in them since they arrived! They have a wool blend lining, are warm, and super comfortable! I am so happy with this purchase! I love that they keep my feet toasty without feeling like clown shoes. I got my normal size. All I can say is thank goodness January is OVER! With the crazy weather we had here in the midwest, it seemed like the longest month ever in the history of...ever! I know winter is nowhere close to being over, especially considering we are getting another winter storm this weekend, but if I keep thinking spring thoughts, maaaaayyyybe spring will come sooner than later??? It seems that damn groundhog was a bit confused this year. The kids aren't going to know what to do when they have to actually go to school for an entire week! It seems like they have been home more than they have been at school. They love it now, but come May, they will be ready for SUMMER! Here's the roundup for last month. Click on the picture to see which items are linked. As always, I try to link exact items, but when those aren't available, I do my best to find a similar one for you! I'd love to know if there is something you are shopping for currently. Vacation clothes? Spring style? Anything in particular? Let me know! Have a great long weekend, friends! Any fun plans for President's Day weekend? You GUYS! I can't believe I have not shared this yet! I typed it up several months ago, and it's been sitting in my drafts just waiting. Today is your lucky day! It's no secret I have a major sweet tooth. That's one of the reasons I wanted to do Whole 30 for the second time...to get a handle on my sugar addiction, which was out.of.control! 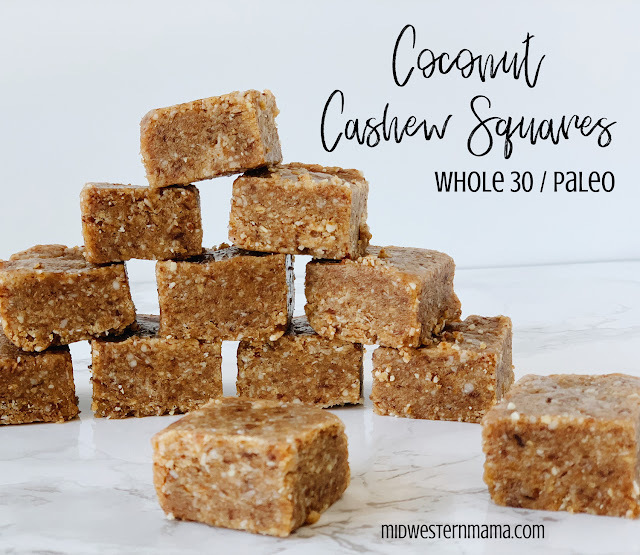 (You can read my thoughts regarding my second round of Whole 30 here) But guess what you can't have when you're doing Whole 30? Yep. Sweets. Bummer, huh? Enter these delicious coconut cashew squares which are pretty much sent from heaven! Now, technically you're not supposed to substitute processed sugary treats for other sweet things while you are on Whole 30. All of the Whole 30 rule followers are going to slap me on the hand for that. The idea is that you are trying to train your brain to stop craving sweet things, especially after a savory meal, when you wold most likely have dessert. How to Add a Pom to ANY Hat! The pom pom craze is REAL! And, I'm not mad about it. I love having a fur ball (or two) on top of my head! The truth is, I feel a little naked wearing hats that don't have a pom on them! They are just so fun! And cute! I have a few beanies that are just plain (no pom), so I decided to spice them up by adding a little fluff to the top! I happened to find some cute fur balls at Hobby Lobby and they turned out to be the perfect accessory to an otherwise boring hat. My store had several different colors to choose from...black, white, brown, grey, and some that were a mixture of the previously mentioned colors. And the best part is, each pom cost $2.99! If you use your 40% off coupon, and an existing beanie, this project could potentially cost you a whopping $1.80! If you are in need of a beanie, my Hobby Lobby store had those as well. We have been talking about renovating our kitchen ever since we moved into this house...so that's over 3 years of cussing and discussing. We go back and forth because it's not the worst kitchen you've ever seen, however, there are some changes I would like to make. But then something comes up, or we get busy and put it on the back burner. Kitchen renovation talk has recently come up again. I love that our kitchen is all white, but it's very dated, and there are things I would love to change. Ideally, I would love new cabinets that extended to the ceiling (getting rid of that soffit), a new countertop with an extended bar area for counter height bar stools, a farmhouse sink, new backsplash, and updated appliances. So, the practical husband is asking WHY would we pay all of that money to have ANOTHER white kitchen? Because it's better I tell him. But, he's not super into that answer. Go figure! ha! Tonight I'm gonna party like it's 1999! Is anyone else feeling extremely old knowing that was 20 years ago. TWENTY. I'm officially a grandma. So, it's a new year. And that means everyone is setting new resolutions and goals. I have been thinking a lot lately about my goals and what I want from this space, and just life in general. It's so overwhelming sometimes to look at the bigger picture, but it's good to sit down and evaluate things periodically. 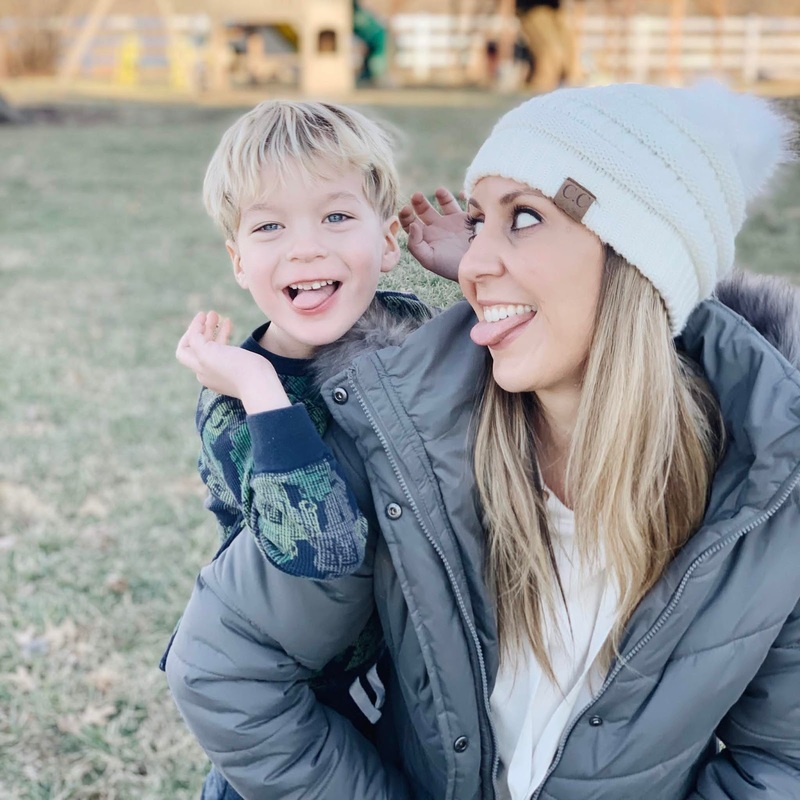 I struggle with finding a balance between managing this blog and also being a mama. I started this blog as a creative outlet for myself, hoping that one day it would turn into something more. I didn't really have a timeline or a goal for myself, but just the hope that by the time Beckham went to kindergarten, I would have established myself enough to try and grow this into a small business. This plan seemed easy enough, but it turns out that this blogging world is SO incredibly time consuming. Not having been on social media prior to starting the blog, I was unaware of how much time is involved in writing not only blog posts, but then also posting on Instagram, Facebook, and Pinterest. Coming up with content, taking pictures, editing pictures, writing captions, linking items, etc. It takes a whole heck of a lot longer than you may think. January is usually a rather slow month for us, but this year is going to be an exception to the rule! Things are happening at the French household, and it's crazy how quickly this month is going to flying by. This nice weather we have been having is so fabulous! I usually dread January and February in the midwest because it's grey and cloudy and just rather depressing. To have not only the sunshine, but also weather warm enough to play outside has been good for everyone's soul! I am rounding up the looks I shared for the month of December, so you can check them out below. To shop the looks, just click on the photo! If I was unable to link an exact item, I do my best to find a similar option for you. The pictures aren't showing up on the email version of this post, so you will need to open the email in your browser to view them, If you still can't see the widget below, you may have to pull this up on your desktop. It works on my phone, but I have heard from some of you that you can't see it. So, check it on a computer and you should be good to go!